Near opposition: Jupiter along with Europa, Ganymede, and Io. 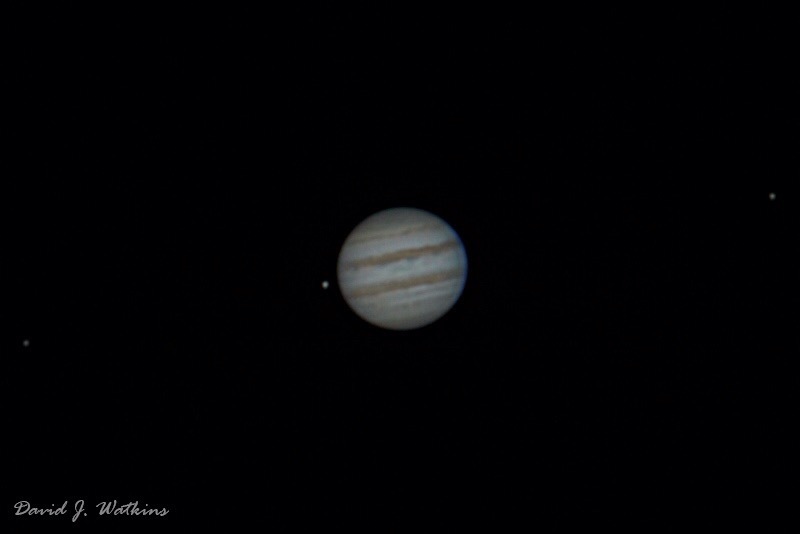 On a frigid February night, CAA member David Watkins used his 5X Powermate on his 8-inch Celestron to view the Jupiter atmosphere as he had never seen it before! From Cuyahoga Falls, Ohio. February 6, 2015 — Every 13 months, Earth and Jupiter have a close encounter. Astronomers call it an “opposition” because Jupiter is opposite the Sun in the sky. Our solar system’s largest gas planet rises in the east at sunset, and soars overhead at midnight, shining brighter than any star in the night sky. This year’s opposition of Jupiter occurs on Feb. 6. It isn’t an ordinary close encounter with Earth (approximately 640 million kilometers), but in Feb. 2015, Jupiter is edge on to the Sun. Jupiter’s opposition on Feb. 6 coincides almost perfectly with its equinox on Feb. 5 when the Sun crosses Jupiter’s equatorial plane. It is an edge-on apparition of the giant planet that sets the stage for a remarkable series of events. For the next couple of months, backyard sky watchers can see the moons of Jupiter executing a complex series of mutual eclipses and transits. The eclipses have already started. On Jan. 24, for example, three of Jupiter’s moon’s, Io, Europa, and Callisto, cast their inky-black shadows on Jupiter’s swirling cloudtops. The “triple shadow transit” happened while Jupiter was high in the sky over North America, and many backyard astronomers watched the event. As Earth’s crosses the plane of Jupiter’s equator in the weeks and months ahead, there will be many mutual events. For instance, on Feb. 5, volcanic Io will cast its shadow on Mercury-sized Ganymede, Jupiter’s largest moon. On Feb. 7, icy Europa, home to what may be the solar system’s largest underground ocean, will cast its shadow on Io. Events like these will continue, off and on, until July 2015. During the last edge-on apparition in 2009, some observers managed to obtain the first resolved time-lapse videos of mutual phenomena. Experienced amateur astronomers recorded satellites ducking in and out of one another’s shadows, moons in partial and total eclipse, and multiple shadows playing across the face of Jupiter. Backyard telescopes have come a long way in the past six years, so even better movies can be expected this time. You don’t have to be an experienced astronomer to experience Jupiter’s opposition. Anyone can see the bright planet rising in the east at sunset. It outshines by far anything else in its patch of sky. Point a small telescope at the bright light and, voila!–there are Jupiter’s cloud belts and storms, and the pinprick lights of the Galilean satellites circling the gas giant below. Try it; 640 million kilometers won’t seem so far away at all. This entry was posted in Uncategorized and tagged Jupiter, member photographs, NASA, northeastern ohio, photograph. Bookmark the permalink.